MyPhone MyA3 Has AMOLED Screen And 1 GB RAM For PHP 1999! 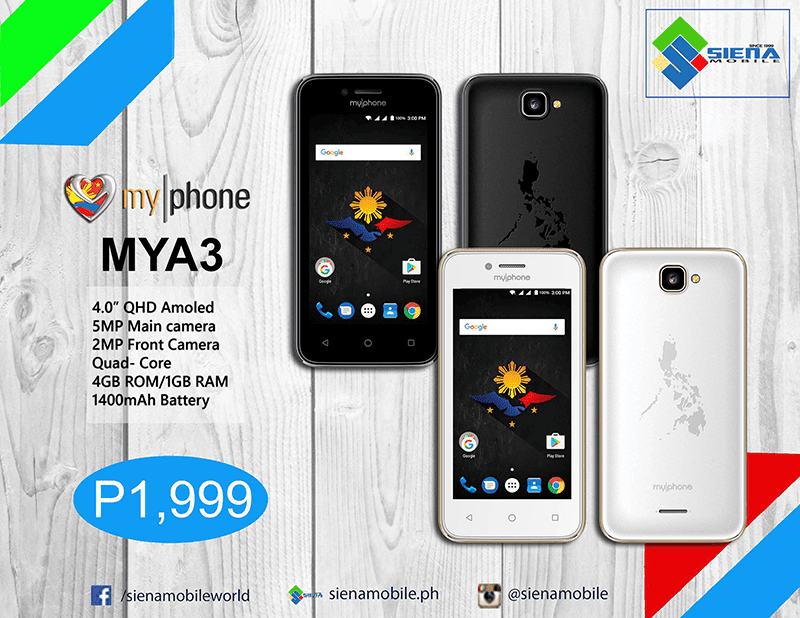 Home / mobile / myphone / news / MyPhone MyA3 Has AMOLED Screen And 1 GB RAM For PHP 1999! MyPhone has silently released the MyA3, a new budget phone equipped w/ a 4 inch qHD AMOLED screen, quad core processor, and 1 GB RAM for just PHP 1,999! MyPhone MyA3 also has 4 GB expandable storage, 1,400 mAh battery, WiFi, Bluetooth, GPS, and dual SIM card slots. It loads w/ an unspecified version of Android operating system. Unfortunately, this is everything we know so far. The rest of the missing details like the exact type of chipset they used, cameras, and other details are still unknown so far. But, for the price, its one of the very few to come w/ 1 GB RAM.